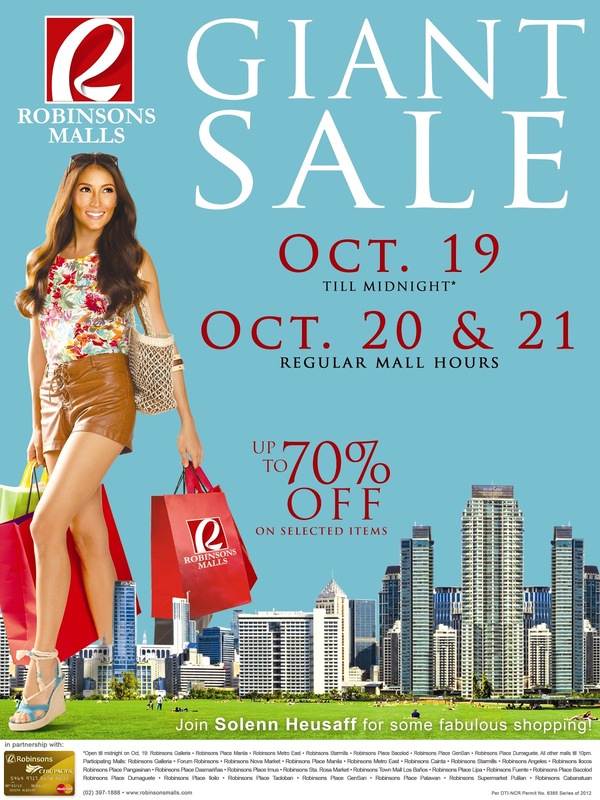 Robinsons Malls Giant Sale Upto 70-Percent! As the holiday season gets nearer, sales and promos are just everywhere. I now reminisce on my great shopping experience at the Red Hot Sale of Robinsons Malls, since I learned that they'll be having another grand shopping spree this October 19, 20, 21 (Friday to Sunday). Have you listed down the people you'll be giving gifts to this Christmas? Better do it now and get ready for the Robinsons Malls’ Giant Sale, where we can enjoy up to 70% OFF on the widest selections at Robinsons Malls nationwide. We can shop until midnight on October 19 in selected malls and at regular mall hours on October 20 and 21. Participating malls include Robinsons Galleria, Forum Robinsons, Robinsons Nova Market, Robinsons Place Manila, Robinsons Metro East, Robinsons Cainta, Robinsons Starmills, Robinsons Angeles, Robinsons Ilocos, Robinsons Place Pangasinan, Robinsons Place Dasmarinas, Robinsons Place Imus, Robinsons Sta. Rosa Market, Robinsons Town Mall Los Banos, Robinsons Place Lipa, Robinsons Fuente, Robinsons Place Bacolold, Robinsons Place Dumaguete, Robinsons Place Iloilo, Robinsons Place Tacloban, Robinsons Place GenSan, Robinsons Place Palawan, Robinsons Supermarket Pulilan and Robinsons Cabanatuan. The sale is not only limited to Robinsons Department Store and Robinsons Specialty Stores, but also lots of participating brands as well. Check it out! For more information, like Robinsons Malls on Facebook and follow @RobinsonsMalls on Twitter.